This September the first class of doctoral students will start at the new PsyD program in clinical psychology offered by The Chicago School of Professional Psychology at Xavier University of Louisiana in New Orleans (XULA). The effort is innovative in a number of ways, including getting a head start on aligning with new standards for “Health Service Psychologists” to be approved later this year by the American Psychological Association. The Xavier based program is also innovative because it will focus on applied clinical psychology specifically for the diverse and multicultural context in south Louisiana, and on “growing PsyD Psychologists here,” explained Dr. Christoph Leonhard, department chair for the new program. “We developed the program to meet the needs of local social service providers of psychological services and of the community,” he said, “and frankly, to provide culturally competent services by people who understand this community, which is a very unique place in many ways.” The Chicago School of Professional Psychology (TCSPP) program will be admitting about 15 doctoral students this fall. The program is hosted by Xavier, the highly ranked New Orleans institution which is the nation’s only Roman Catholic Historically Black College and University (HBCU). “We have applicants from current students in all the HBCUs in the area,” said Leonhard, “including Southern, Dillard, and certainly Xavier. We also have applicants who have already completed their undergraduate degrees at the local institutions. So far, we only have one applicant without a prior connection to the area.” The Chicago School developed and will manage the curriculum and faculty for the new program, and XULA provides support services and hosts the department on its campus. The PsyD (Doctor of Psychology) degree is the only program of its kind in the state, and the only other clinical psychology training after that at Louisiana State University in Baton Rouge. Clinical neuropsychologist and Assistant Professor in Clinical Psychology in the new program, Dr. Matthew Holcomb, said, “… the PsyD program at Xavier was inspired by the need that southern Louisiana currently has for well trained and qualified clinicians.” He pointed out that from the beginning Leonhard has developed relationships with area agencies for practicum training and externships for the students. “Given that we are a PsyD program, which is invested and emphasizes exposing students to direct clinical work, our students are going to have first-hand experience addressing the multicultural needs of the area, as well as developing an impressive network of professional contacts,” said Holcomb. Holcomb will help train the PsyD students in brain-behavior relationships and assessment practices, his own clinical and research interests being in pediatric neuropsychology. The program organizers have limited their recruitment to students inside Louisiana. Leonhard hopes to grow PsyD psychologists here, and who will remain here, in order to serve the sometimes unique needs of the Louisiana culture. “Studies indicate that newly graduated psychologists who have to leave the state to get an advanced degree do not return,” said Leonhard. “So the emphasis of this program is to educate and train our own.” To help them reach this goal, Leonhard and his colleagues created an Advisory Committee of local professionals, including two area psychologists, Dr. Janet Matthews and Dr. Michele Larzelere. Dr. Matthews explained that she has met with many of the candidates for faculty and administrators in the new program. Dr. Christoph Leonhard, department Chair for the Chicago School of Professional Psychology at Xavier, at his desk. 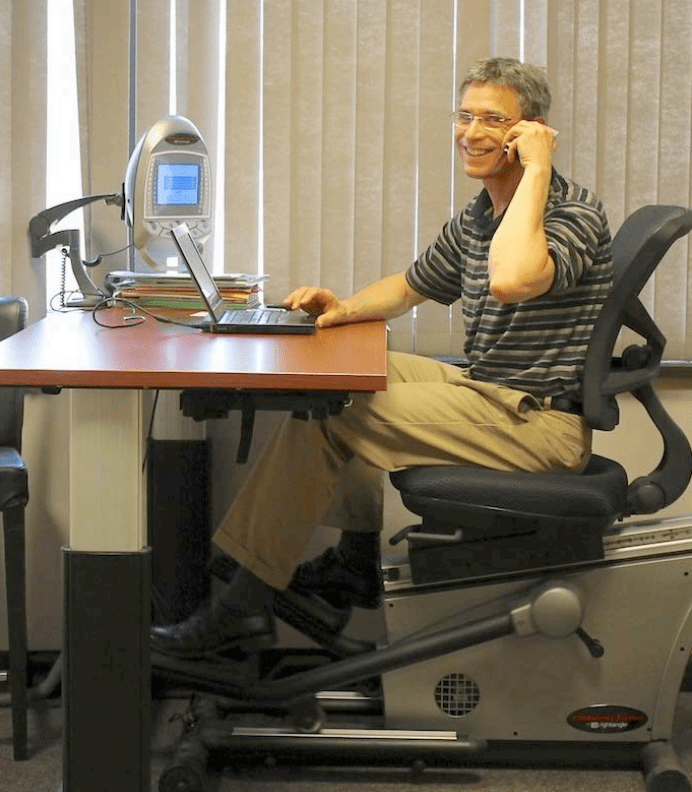 Dr. Leonhard has designed the machine he’s sitting on to help stem the problems for people who have to sit all day at a desk. He has a background in behavioral medicine and health services. “We have also discussed student recruitment processes, curriculum issues, and overall program philosophy,” Matthews told the Times. “This program is designed specifically to meet community needs,” she said, a topic Matthews knows well, having taught at Loyola for three decades and retiring last year. “With the focus on primary care/integrated care, and cultural diversity issues,” she said, it is ideal for the Greater New Orleans area.” “It has been my experience teaching here for the past 30 years that we have local students who would make solid psychologists but cannot, will not leave the community.” Matthews believes that the new program will allow them to remain in the area, and help assist what she views as an underserved community, in terms of psychological services, she noted. The doctoral students in the TCSPP program at Xavier will complete studies in four models of intervention: Cognitive Behavioral, Psychodynamic, Humanistic Existential, and Systems. The program includes a Research Clerkship model where the students are paired with mentors from the faculty. Three years of practicum and one year internship are included in the 106 total credit hours that will take five years to complete, and while not yet accredited by the American Psychological Association (APA) the program will prepare students to sit for the psychologist licensing exam. The PsyD program at Xavier will take full advantage of the changes in approach brought about by the Patient Protection and Affordable Care Act (ACA) that requires prevention and a focus on primary care and community health. APA will be shifting its training model later this year in response to ACA, and the Chicago Professional School at Xavier will align with these changes. “To be in compliance with what the ACA calls for, we’re now going to be training health service psychologists– –psychologists that provide health service, mental health being a health service, said Leonhard. “Basically the APA is shifting to a new accreditation model for selfstudies due after September 2016, and they are abandoning the G&P, the Guidelines and Principles,” he said, and there will be “new opportunities for clinical psychologists to be health service providers in interprofessional care teams, including in primary care.” “One of the things that most people don’t know about the Patient and Affordable Care Act is that it mandates interprofessional care teams throughout health care but importantly, in primary care,” he said. “We used to train people just in one profession––as psychologists, or as physicians, or as pharmacists or as physical therapists and somehow later on they were supposed to figure out how to be part of a multidisciplinary team,” Leonhard said, “So now the emphasis is on interprofessionalism, where the different professions are co-equal participants in the enterprise to improve the patient’s health.” While there are still a lot of unknowns as to exactly how ACA will unfold, Leonhard believes this will be a good step. “I think key is getting psychologists to be the behavioral health providers in the interprofessional teams, especially board certified psychologists,” he said. But the change in training focus will also include changes in the traditional methods. “For example, I’m just rewriting the Psychometrics course syllabus where the scales that are being used in primary care are very different from the battery type testing that a lot of times psychologists do. Because, it is very quick––its five items, seven items,” said Leonhard. “It’s oftentimes tests and scales that psychologists aren’t really familiar with, that physicians use to assess substance use potential or depression, anxiety disorders. Just on the quick, because when you’re in primary care, it’s very fast.” Dr. Janet Matthews also noted that another advantage of the new program is the focus on evaluation methods and outcomes research methods. “As students move into their practicum sites, they will be trained to help those sites do the type of outcome evaluations that is becoming more of a requirement for funding,” she said. “In this way, their work can influence both the quality of current service and also support future growth”. The new program offers two formal focus area — Clinical Psychology in a Diverse and Multicultural Context and Behavioral Medicine/Health Psychology – which Leonhard and his team at Xavier hope to help meet this growing need and to train psychologists for the healthcare services of the future. Xavier University of Louisiana serves more than 3,000 students at its location in New Orleans, Louisiana and is accredited by the Commission on Colleges of the Southern Association of Colleges and Schools. Xavier’s Psychology Department, chaired by Dr. Elliott Hammer, will be part of the supporting structure for the program, but is separate in decision-making from the new program. The Chicago School of Professional Psychology is licensed by the Board of Regents of the State of Louisiana. TCSPP owns and provides oversight for the curriculum for the Clinical Psychology PsyD program. Tuition is currently $1,260 per credit hour. While the program is not APA accredited at this time, the curriculum prepares graduates for the psychologist licensing exam and to meet requirements for licensure in Louisiana. For more information see www.TheChicagoSchool.edu/XULA. This entry was posted in Front Page Story, News Stories on April 19, 2015 by Jamilah.